A Bucket List is the list of things you want to do, places you want to see, things you want to accomplish before you “kick the bucket”. These are the things you REALLY want to do in the time that you have left … so you can die with a smile on your face. The tragedy is that for many people – especially doctors – your bucket list is a source of sadness and guilt. For many it is a list of the things you have sacrificed to be a physician – the things left undone … and it doesn’t have to be that way. Unlike the movie, ” The Bucket List “ … you don’t have to wait until you are in the process of actually dying to really live. In his ground breaking book, “Getting Things Done”, David Allen points out that most of the stress people feel about accomplishing tasks – especially the big ones – is that your list is kept in your head. It is disorganized, only partially remembered and forms an “amorphous blob of undoability”. Your subconscious attempts to hold on to the list by perseveration and guilt. You know what I mean. At odd times you will remember something you haven’t done yet … and FEEL GUILTY ABOUT IT. This is especially true when we are talking about the big, important things that make up your Bucket List. There is a place in your brain that feels it is the keeper of your lists and it is constantly running through the list items because it doesn’t trust you to remember them. It’s like a Gerbil on its wheel … constantly running. This arrangement is tiring and inefficient and no fun at all. a) You free up a lot of energy because your Subconscious Gerbil can step off the wheel and relax. b) You can see the whole list and begin to PRIORITIZE it. You can make plans to actually pick the juiciest item on your Bucket List and get on it. I recommend you do this Bucket List listing with a Pen & Paper … NOT digitally. You don’t trust your computer not to crash and your subconscious doesn’t either. Taking a pen and creating your list on paper is an act of converting your ideas, dreams and desires into physical reality. It goes from a thought to a list on paper you can hold in your hand. This is the first step in making anything real in your life. So … write your list down and put it in a folder stored in a safe place you won’t forget. What if you come up empty? I have seen this with a number of physicians. “Dike, I tried to write down my Bucket List and there was nothing there.” This is NORMAL for some doctors. You might begin to feel bad about it and start to judge yourself … let that go for now and realize you have been powerfully conditioned to not have a bucket list. It is part of becoming a physician. You put your needs and desires LAST because your patients and career come first. -> You may need to give yourself permission to dream. Know that it is OK, healthy and part of a life well lived to have your own desires, dreams, wants … this is NOT anything to do with being selfish. -> You may need to ask your best friends what they think are things you long to do – or things you would REALLY enjoy – that remain undone. Make Your Bucket List on paper and put it in a folder in a safe place before you continue. It doesn’t have to be Perfect, 100% complete or a thing of beauty. Most people’s Bucket List is full of all sorts of items that don’t belong there. It is a recipe for guilt if you put things on something as important as your Bucket List when they are really just a whim or worse yet, an impossible dream. Use this prioritization tool I adapted from the book, “The Five Wishes” by Gay Hendricks. When you have completed Step Two you will have your AUTHENTIC BUCKET LIST in your hands. When you have an AUTHENTIC BUCKET LIST … one that contains ONLY those things you MUST do before you die … your Bucket List is transformed from a guilt machine to a powerful way to live a rich and fulfilling life. Take one item at a time from your Bucket List – for the sake of this example, let’s say visiting Macchu Pichu is on your list … NOW … imagine this scenario. It is 2022 and in the last decade you and I have become good, good friends. I heard you were in the hospital and have come to visit. You have cancer. You are dying. You won’t make it out of the hospital. I have taken a seat by the side of your bed … even brought you some flowers. We are having a conversation … with uncomfortable gaps in it … you are dying and we both know it. 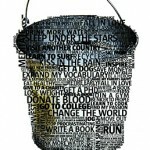 Take your Bucket List and run the Bucket List Reality Check on each item. Make a New List of Items that Pass The Test. This is your Authentic Bucket List. Don’t throw the old list away or the gerbil will jump back on the wheel. Once you get done with the Authentic Bucket List Items … this list becomes raw materials for future accomplishments. You decide which one. Could be the simplest, the juciest, the longest overdue … you decide. Even if you have to look ahead over a year ... pick a date and put this Bucket List Item on your schedule NOW. A visit to Machu Picchu is on your Bucket List. You look at your schedule and realize there is no way you could do a big trip like that until next fall. Don't let that realization stop you. Block out the time next fall NOW. The act of putting this item in your calendar will make it much more likely to happen. That's right - buy the tickets now. Even if you can't go for 18 months, buy the tickets now. Here's why. NOTHING will make a doctor go on vacation more than having bought the tickets already. You will move heaven and earth to go on this trip if it is paid for. It is time to step out of Einstein's Insanity Trap. Action is the key. This is not just a blog post. It is not just information for you to understand. This is an opportunity for Transformation for you if you choose to accept it. Now may not feel like the right time to take these steps. You may feel like you are too busy to take this “Bucket List Project” as well. Remember … your clock is ticking (just like mine) and we don’t know how much time is left. If you took an hour to complete the steps above … the result would be a giant step towards an Authentic Bucket List Item this week. Just imagine living one of your Bucket List dreams. These three steps can make that happen for you and your loved ones.